I realize I normally talk about fun lunches that you can make your kids. I also like to talk about healthier food ideas. However, I was a kid in the 80's and have been a bit nostalgic lately. When you were growing up in the 80's you didn't hear about organic, dye-free, or locally sourced. Most kids I knew were just lucky if they got the name brand snack as opposed to the knockoff. This is the time when you could buy bubble gum cigarettes, and Wonderbread was accepted as a normal part of a healthy school lunch. Let's just say we weren't as worried about food allergies or clean eating. As a kid, these are the tasty (and terribly unhealthy) treats I remember that ruled the decade. It's probably better for everyone that they are gone, but there's a small part of me that wishes my kids could have experienced the 80's treats that I did. I'm sure I missed some so let me know in the comments which snack foods you remember with fondness. 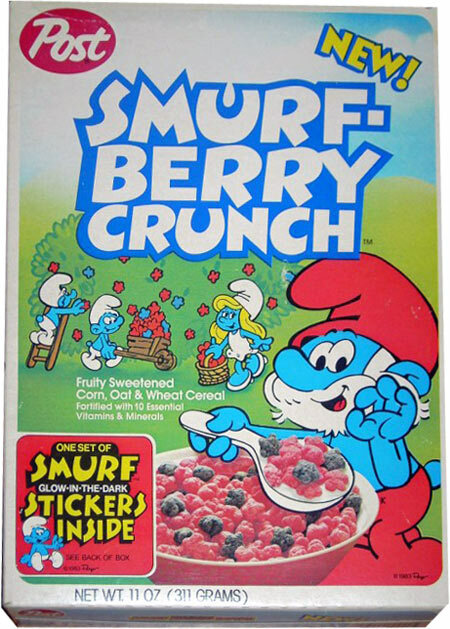 in the 80's The Smurfs were a staple of Saturday morning cartoons and cereal bowls. They overflowed with berry flavoring so they more than likely were only 1% nutritious but 100% delicious. There have been Push Up Pops around forever, but the Flintstones flavors have always been far superior. When they mixed the orange flavor with the Nerds. Well, that was sheer brilliance. Yes I know these have been remade but they can't compare to the original. 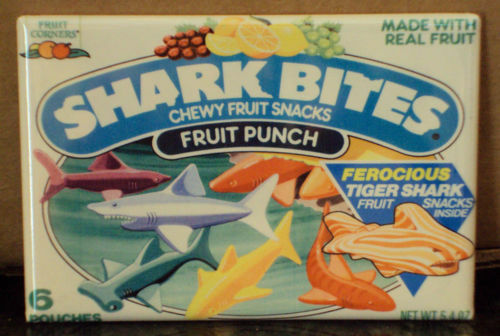 Sure they were filled with everything that was horrible to put into your body, but remember when you opened a pouch and found the great white shark flavor? You immediately went to your happy place. If that happy place involved ocean predators. Before we took notice how bad most fast food was for you, kids were enamored with Happy Meals. But it wasn't really for the nuggets, they could have included tin foil smothered in peanut butter in that box. 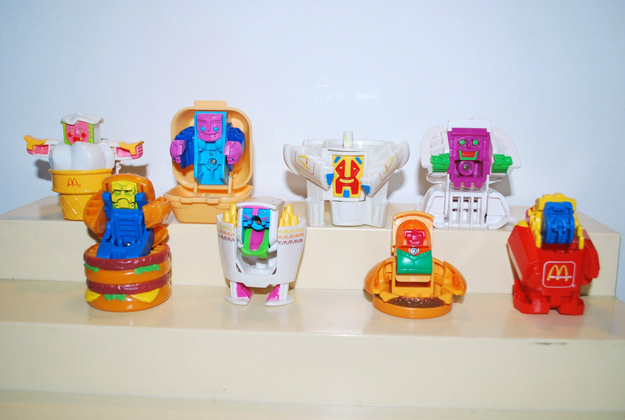 Every 80's kid knows this was the glory years of the Happy Meal toys. From The Muppet Babies to the Garfield vehicles, no other decade compares. The one toy to rule them all? Mcdonald's Transformers. I remember moving to a new town and starting school. It was difficult at first, but you know what got me through? Liters of sugar laced drinks in my school lunch. I always wanted these, but my parents wouldn't buy them (for good reason). I think they felt sorry for me so for one glorious week it was all Squeezeit, all the time. What's better than stuffing all sorts of chemicals into snack size spheres? How about super sizing it into giant sandwich size handfuls. The only thing as big as the taste was the totally tubular 80's commercial that advertised them. Who wouldn't want to be as gnarly as those kids hanging out, dancing, and eating enormous cookies? There's not much to say about these. 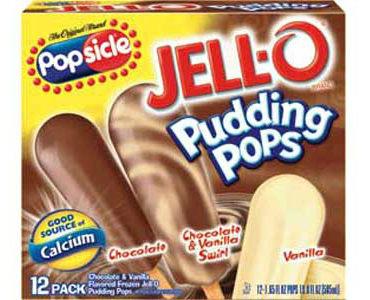 If there was a choice in the freezer aisle, the go-to was always pudding pops. The secret was eating all the swirl flavor before anyone else got their hands on them. No one wanted to be stuck with vanilla. There are plenty of other 80's cereal that could have been on this list. Gremlins, Ghostbusters, Teenage Mutant Ninja Turtles, and Strawberry Shortcake to name a few. 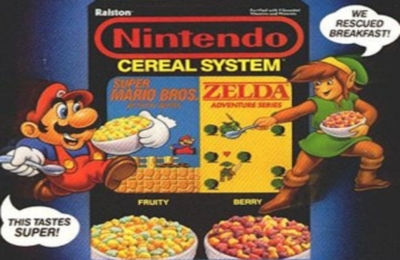 However, the Nintendo cereal beat them all. You got Super Mario Brothers AND Legend of Zelda...in the same box! Fruity flavored in one bag and berry flavored in the other. They obviously tasted way different from each other. You knew that in every bite you were tasting cereal glory, even if you couldn't beat Mike Tyson in Punch Out. Soft shortbread surrounded rich fudge, whoever invented these should be given an award. There were probably 200 calories in each one, but we didn't care. You had a sleepover, watched Goonies, played NES, and easily burned through a package of these badboys. You can't beat that. 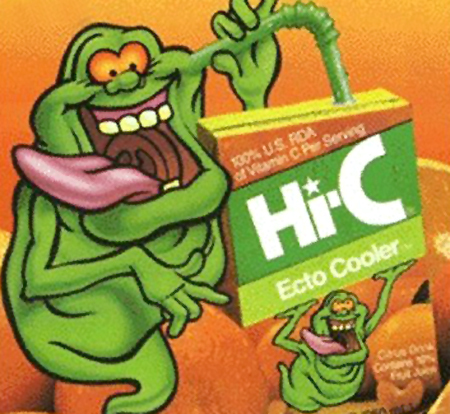 The Holy Grail of 80's snacks has to be Hi-C Ecto Cooler. Hi-C was pretty amazing by itself, but when they added slime to their 10% fruit juice, who knew magic would happen? Maybe it wasn't actually green...or slime, but it doesn't matter. 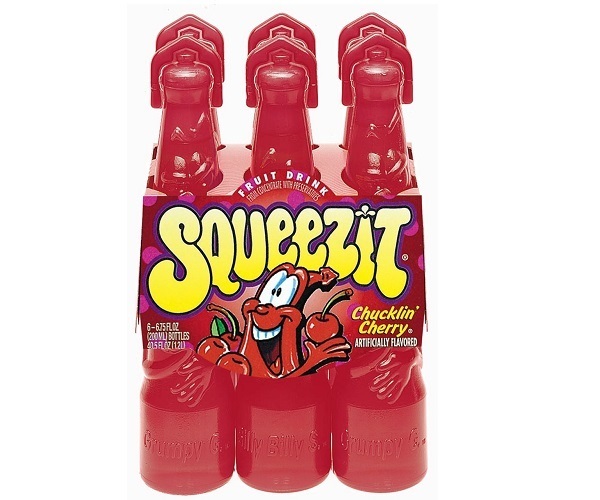 This drink defined the snacks of the 80's for me. What I wouldn't give for just one more box. Thank you so much for this! I, too, am a child of the 80's and this brought back so many awesome memories. 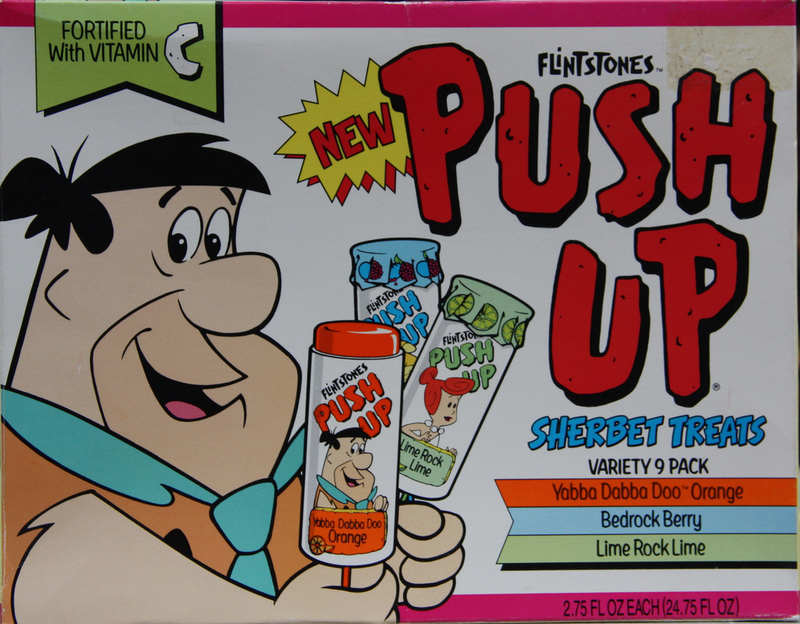 I as actually just telling my husband (who is just enough younger than me that he missed out on some of this) about the joys of the Flintstone Push-ups. I have been "lurking" around your blog for a while - I love your lunches! You have amazing creativity and skill. 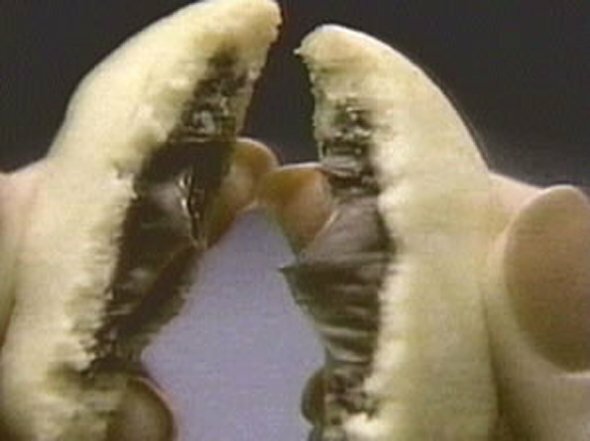 Sorry that it took an 80's junk food post for me to break out of the lurk shadows! Tina thanks so much for following my blog. I'm glad this fun post could bring back some happy memories for you! Cosby still delivering the pudding pops. He just does it personally now and only for young ladies wanting to break into the comedy industry. 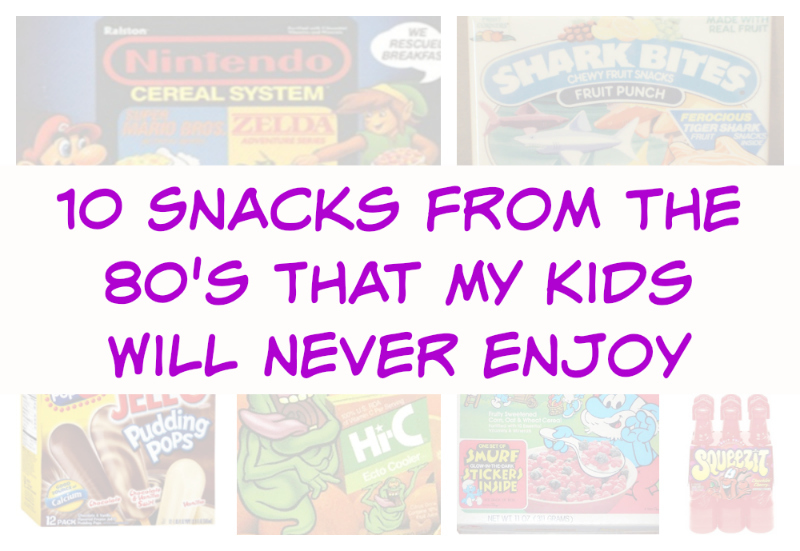 I've probably eaten everything on this list at least once as a kid of the 70s/80s. Now I probably wouldn't eat any of it. The one time we got our daughter a happy meal the toy was a total piece of junk, nothing like the days of yesteryear. The original's were awesome. Wish we still had them here. Happy meal toys leave much to be desired now. Nothing like the golden years of the 80's. Brings back memories even though these were not in the budget of my single parent. Still, every so often we would get pudding pops. I do remember many of these, though the pudding pops are the only ones I remember my parents ever buying. There were healthy eating fads and trends then - I remember standing in GNC stores watching the machines grind peanuts into salt and sugar free peanut butter. I found this post while trying to find images of the carob stars and Amaranth Mills cookies that we got as treats when our parents went shopping at the whole foods stores. The only treats that seem to still exist are the honey sesame candies and the dried papaya. Pizzarias chips from Keebler. I was raised by a hippy mum who never let us have junk food, but sometimes I would beg her and be allowed to indulge in these delicious (possibly cancer inducing) crack crisps.